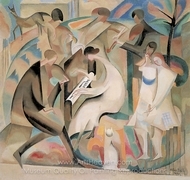 Cubism is an influential art movement that originated in Paris during the early part of the 20th century and is considered the first movement in modern art. The name was coined by a French art critic in 1908, after seeing a painting which was broken up by dozens of little squares or cubes. 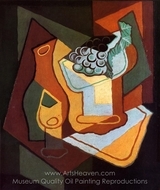 The famous Spanish artist, Picasso was the most famous Cubist; other well known and influential names include Georges Braque, Juan Gris and Fernand Leger. Although the term Cubism is mostly associated with painting, there were attempts at cubist sculpture and even architecture � most notably, the square, angular buildings of Le Corbusier, designed during the 1920s. 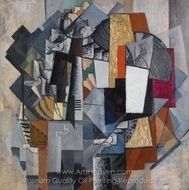 The Cubism movement can be further broken down into two phases � Analytical Cubism lasted until around 1912 and was characterized by simple color schemes and an emphasis on right angled lines. 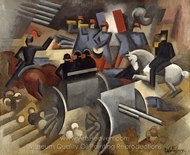 Synthetic Cubism dates from around 1912, in which colors were increasingly vibrant and collage was used more and more. 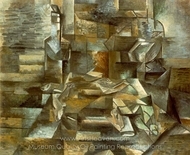 The most noticeable characteristic of Cubism was its use of squares, or planes to help to break up the surface of the painting. One of the aims of the movement was to show an object from different points of view. Picasso and his contemporaries realized that if a person walks around a sculpture or statue, they have different views of the same object. Cubism was an ambitious attempt to depict these different views within the limitations of a two dimensional piece of canvas. 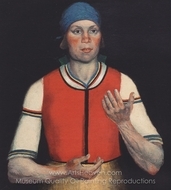 This technique of creating space was used instead of more traditional methods such as perspective, foreshortening and the use of shadow. 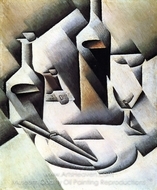 Unlike some other abstract art movements, the subject of a cubist picture is generally still just about recognizable and many of their subjects were of mundane and everyday scenes � a bowl of fruit, musical instruments or a bottle and glasses. 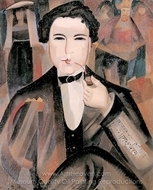 Cubist painters also helped to pioneer the use of collage in art. 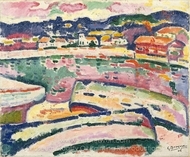 As with most art forms, several things helped to influence the growth of Cubism. 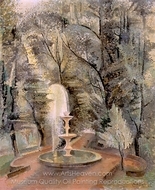 Picasso and his fellow artists were impressed with the work of Paul Cezanne, who had been experimenting with perspective and color and trying to see painting in more abstract forms. Cubism was also influenced by African art � many cubist portraits are similar to African masks, with their big round or square features. Using themes from African art was also a way to highlight a new and exciting culture. 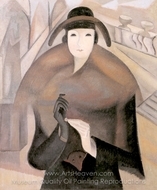 One of the biggest influences on Cubism was simply what was happening in the world at the time. Technological advances were being made everywhere � sound recording, film and photography. The car had just been invented and the Wright Brothers had just made their first flight. 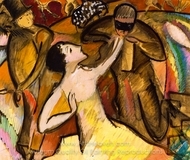 Cubism was meant to be a different and innovative way of seeing things and a means to reflect the exciting times, as well as a way of rebelling against the style of art that had gone before. At the time, not everybody liked this unique new art form. 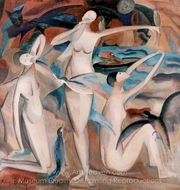 One of the earliest Cubist paintings was Picasso�s �Les Demoiselles d'Avignon� painted in 1907, which depicts five female nudes distorted into flat, angular shapes. 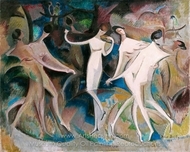 The work caused an outcry when it was exhibited in the United States in 1913. 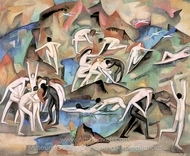 Today, it is considered one of the greatest and most influential of 20th century paintings.